I totally was planning to post picture of my not-so-exciting Christmas tree today, but plans changed for the better. Did you ever buy an item that makes you want to do a happy dance every time you see it? Multiply that by 4 and you have my weekend. I hit the jackpot on craigslist and it makes me giddy. From one singular seller, I robbed bought 4 pieces of furniture for a grand total of 70 buckaroos. and I already have plans for all 4. 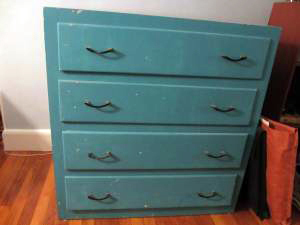 The story began as I perused craigslist looking for a mid-century dresser for my future nephew’s nursery. My sister’s expecting her first child beginning of May and I’m taking responsibility for the nursery. I have a picture in my head of mid-century pieces mixed with more traditional elements (much like the nursery I showed here), so off to craiglist I went. I’ve been stalking craigslist on and off for a few months, but I wasn’t finding anything that spoke to me (or at least not anything that wasn’t ridiculously expensive). Until this weekend. 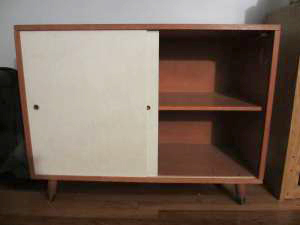 My nephew will be the coolest baby on the block with his midcentury dresser and cabinet which will be custom refinished by his awesome auntie. They both need some significant love, but the bones are there. At $15 a pop, “no” wasn’t in my vocabulary. 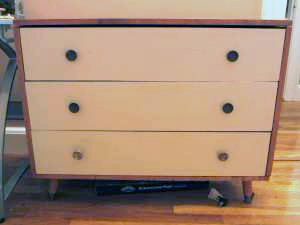 The 3rd item from the same seller is a wonderful dresser that just screamed to me that it needed to hold tools and craft supplies in my in-progress basement work-area. When furniture yells at you, you listen. This vintage turquoise gem was also a whopping $15. The last item is a flipper. 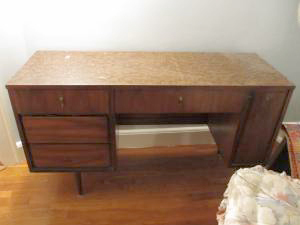 What I mean by that is: I have no place for this desk, but it has too much potential for me not to bring it out. It’s my responsibility as a designer to restore this amazing piece to its former glory and let someone else enjoy its beauty. I’m being melodramatic and overly verbose. What I really mean is that I’m going to refinish it and sell it. …and hopefully make lots of money. Its truly amazing in person (I say that of course because I can see past the contact paper top and broken hardware to what it should look like), the picture really does it no justice. Did I mention I got it for only $25? After I found these on craigslist and contacted the seller, I was grinning from ear to ear, just ask Hubby. We had to take 2 trips to get all my goodies, but it was worth it. It’s probably a good thing that you can’t see me doing my happy dance. It would be embarrassing. For both of us. I have to hurry up and finish my work space so I can get started on all my furniture refinishing projects- now I have even more motivation!